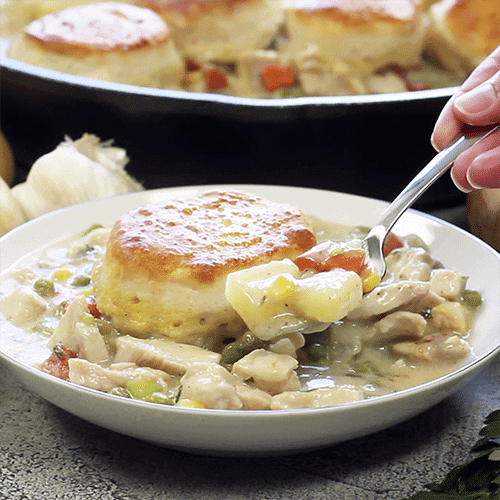 If you love one skillet meals, then this skillet chicken pot pie is a must try. Make this skillet recipe in under an hour for only about $10.00! 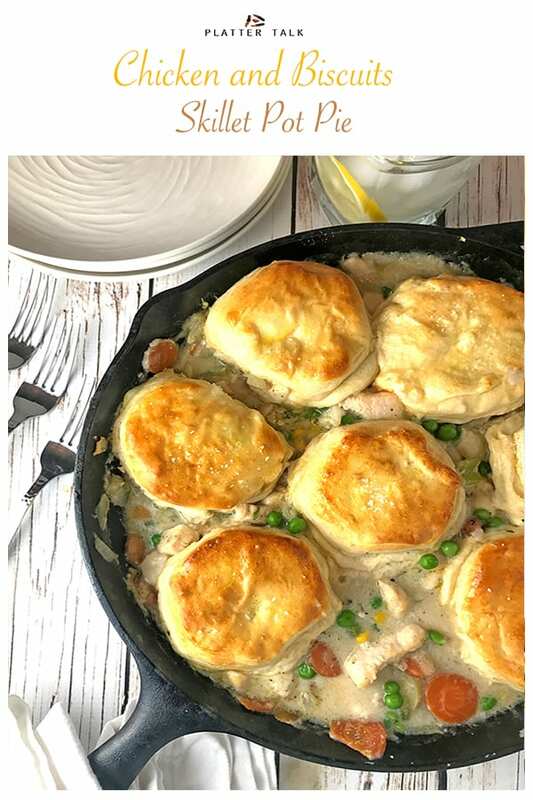 If you love skillet recipes, this easy homemade chicken pot pie recipe is a must try! 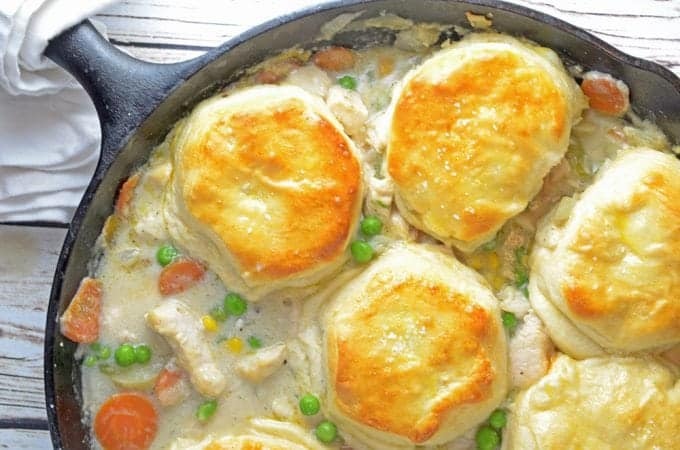 This Skillet Chicken Pot Pie is a One Skillet Meal! Our family of six boys loves pot pie dinners , which is why we make them so often. You can’t have too many good recipes for pot pie, especially when they’re this easy, economical, and delicious. 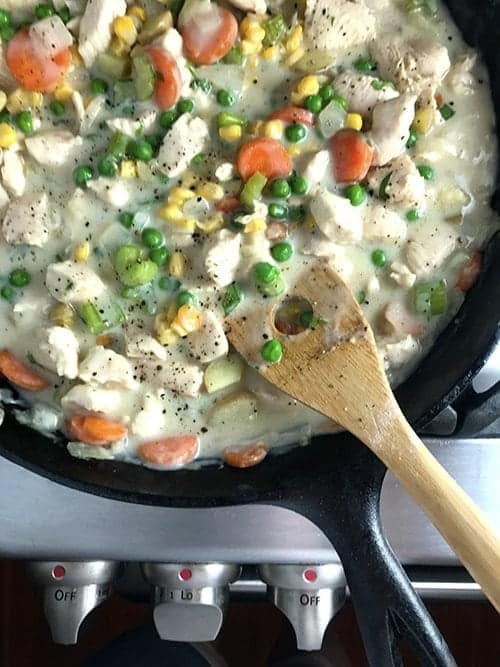 This chicken skillet recipe can be ready to eat in just 35 minutes! I had my eye on this easy skillet meal for some time. It’s beyond easy to make and because I like potatoes in my pot pie, I decided to add a few. 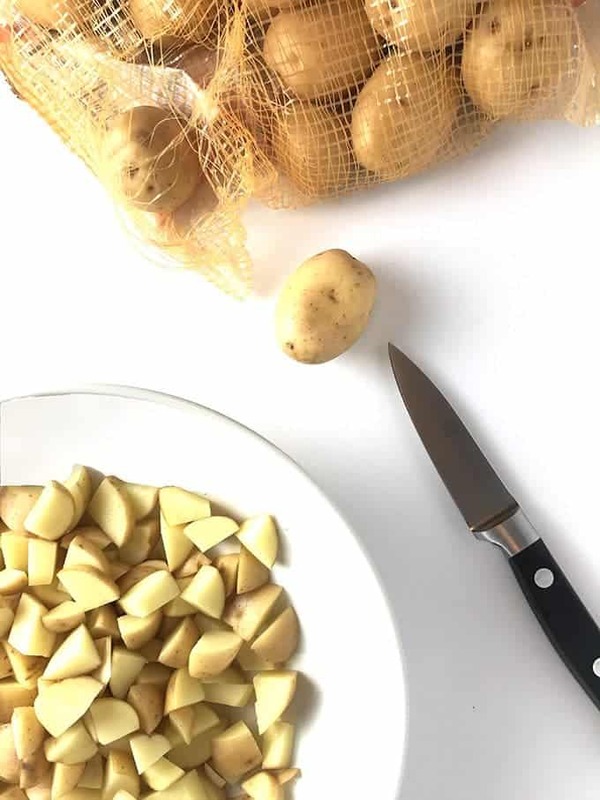 The other reason that I added some spuds is because I love peeling and cutting potatoes. Weird right? I For some reason I find it relaxing. Don’t judge me. Potatoes are a filling and inexpensive ingredient to this delicious skillet meal. Not just that, but this recipe uses my favorite kitchen tool, the timeless cast iron skillet. I got mine from amazon which has a great selection of, cast iron skillets. 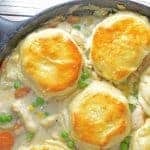 Start this skillet chicken pot pie recipe with an easy chicken and vegetables base. 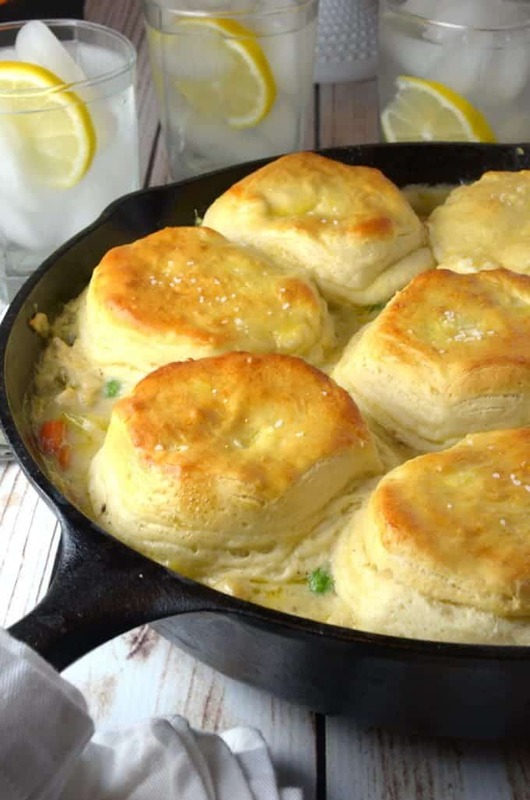 For the topping of this skillet recipe, simple add a can of refrigerated biscuits! Add some flour, broth and cream. Toss in some diced chicken breast, and seasoning. Place some store-bought biscuits on top of the mixture and then bake. Brush the biscuits with a light eggwash for a beautiful brown finish on this one skillet meal. As I mentioned earlier, I’ve put together a few pot pies before, none have been better than this one. It all makes me chuckle, thinking back to growing up and how I loved the frozen pot pies from the grocery store. Back then, the “good” ones always had a crust on the bottom. Not this one, though. And guess what, it’s one of the really good ones! 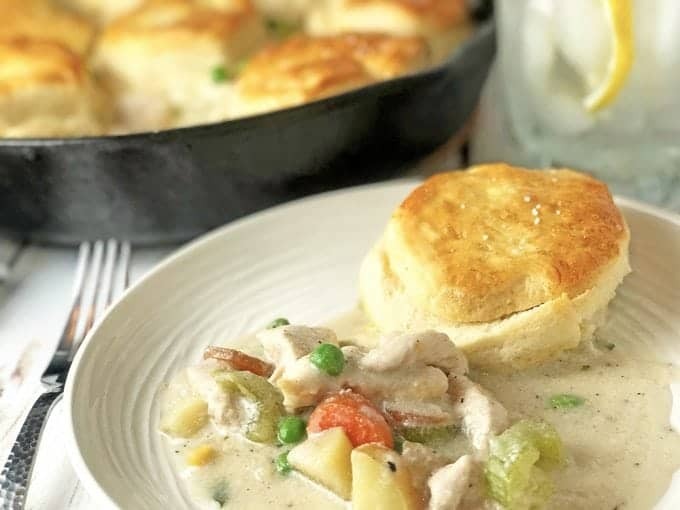 If you love One Skillet Meals, this Skillet Chicken Pot Pie is a must-make! 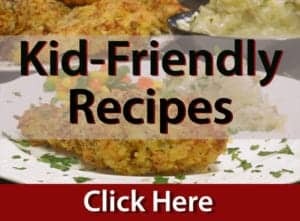 More Skillet Recipes and One Skillet Meals for You to Enjoy! 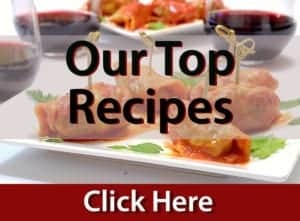 Looking for more skillet recipes? We’ve got you covered! This one skillet meal is Adapted from Judy Kim via Delish. Try this simple and inexpensive skillet recipe soon! Using a large cast iron skillet over medium heat, place olive oil and add thyme, garlic, potatoes, celery, carrots and onions. Stir with a wooden spoon until the vegetables soften, about 5 to 7 minutes. Season with salt and pepper and then add flour. Continuously whisk until flour is cooked and well incorporated. Slowly stir in the broth and cream until mixture is smooth. Add chicken and bring to a boil; simmer until thickened about 5 minutes. Stir in frozen peas, corn and parsley. Top with biscuits in an even layer, brush tops with egg wash.
Bake until biscuits are golden brown and filling is bubbling, about 25 minutes. Serve immediately. Substitute milk for the cream to save a few calories. If biscuits start to get too brown on top, place a sheet of foil over them until pot pie is done baking. Don't be afraid to make this your own, use the ingredients and seasoning that you prefer! Thanks so much, Thomas! 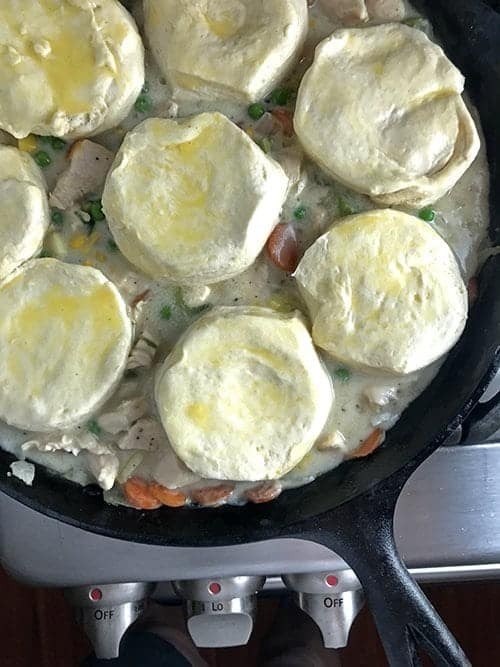 We hope you try this hybrid version of skillet pot pie! Do you use raw chicken or is the chicken pre-cooked? 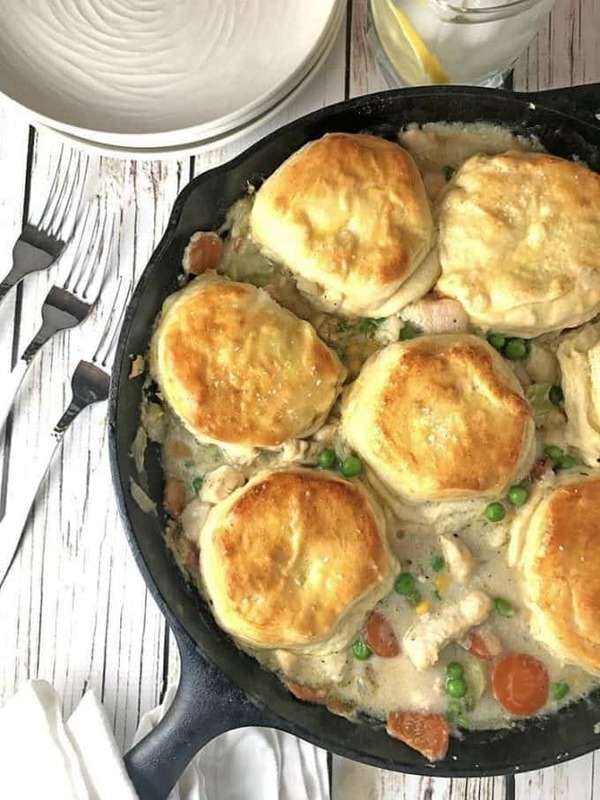 For this chicken and biscuits pot pie recipe, you will use raw chicken. I have tried this last night and it is great! I just added some mushrooms with it! I know it will be made again soon. Thanks for the feedback, Theresa; sounds like you made a tasty modification. to. this skillet meal! This looks incredibly comforting! I will definitely try this! This couldn’t look any more perfect! This looks delicious! This sounds like my kind of comfort food! This is one of my ultimate comfort foods in the fall and winter. I become utterly gluttonous. Must make this soon. I think this is such a great idea! I love this WAY more than making a pie! YUM!! So comforting and delicious! The perfect hearty comfort meal. I cannot get enough of it! Thanks, Amanda, we hope you give this one a try soon!